Michelangelo Buonarroti was born on March 6, 1475, in Caprese, Italy, a small Italian village near Arezzo, Tuscany. For several generations, his family had worked as bankers in Florence. His father, Lodovico di Leonardo di Buonarroti di Simoni, also held occasional government positions. At the time of Michelangelo's birth, his father was serving as a Florentine government agent in Caprese and his mother was in failing health. His parents decided to entrust the care of Michelangelo to the wife of a stonecutter who lived in the town of Settignano where his father owned a marble quarry and a small farm. Michelangelo's mother died when he was 6 years old. From childhood Michelangelo was drawn to the arts. However, his father considered this pursuit below the family's social status and tried to discourage him. Michelangelo's father recognized his intellectual potential and enrolled him in the school of master linguist, Francesco Galeota, to prepare young Michelangelo for a career in business. Michelangelo, however, showed no interest in his schooling. He preferred to copy paintings from churches and seek the company of painters. Through the course of his studies, Michelangelo met a student of painter Domenico Ghirlandaio, one of the most fashionable painters in Florence. In 1488, at age thirteen, Michelangelo followed his interest in the arts, and became an apprentice in Domenico's workshop. Michelangelo's decision to defy his father and risk his family's social standing in Florence created a distance between them that would haunt Michelangelo throughout his life. In 1489 Michelangelo left his apprenticeship after one year and excepted an invitation from Lorenzo de' Medici, the Magnificent, a retired sculptor and ruler of Florence. There he studied sculpture and anatomy at the school in the Medici gardens. During his studies, he was introduced to important scientists, and poets. Though their radical ideas were often at odds with the artist's strong religious beliefs, these men intrigued him. Their impact is evident even in his earliest works. His most important works during this time include the Madonna of the Steps (1490-1492) and Battle of the Centaurs (1491-1492). Lorenzo de' Medici died in 1492, and the Medici family fell from power. 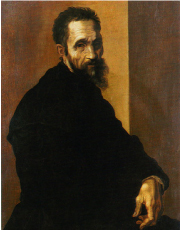 As a result, Michelangelo decided to return to Florence for a short time prior to moving to Rome. It was there that he carved his Pieta, a sculpture of Mary supporting the crucified Christ across her knees. In 1501 Michelangelo returned to Florence. Recognized, as the most talented sculptor of central Italy, he was commissioned to carve the Biblical hero "David" for the Florence Cathedral. Seven years later he received one of his most important commissions when Pope Julius II asked him to paint the 12,000 square foot ceiling of the Sistine Chapel. Michelangelo died on February 18, 1564. He excelled in poetry, sculpture, painting, and architecture, and his idealized and expressive works have encouraged many to regard him as one of the greatest masters of European art. 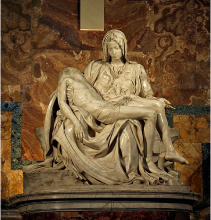 The Pieta is a sculpture of Jesus after his crucifixion, laying on the lap of his mother Mary. It was completed when he was just 24 years old. The iconic image is a section of the ceiling called the "Creation of Adam". It is one of the most known works through out the world.